Encrypting data-at-rest is a key element when addressing these concerns. Most storage products offer encryption at an additional cost. 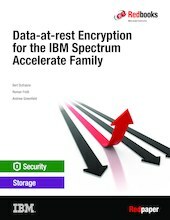 The IBM® Spectrum Accelerate family, which includes IBM XIV® Storage System, IBM FlashSystem® A9000, IBM FlashSystem A9000R system(s), and IBM Spectrum™ Accelerate Software provides data-at-rest encryption at no charge. Clients can take advantage of encryption and still benefit from the lower total cost of ownership (TCO) that the IBM Spectrum Accelerate™ family offers. For IBM FlashSystem A9000 and A9000R, clients now have a choice between an external key manager-based implementation or a local key based encryption implementation. The local key solution offers a simplified deployment of data-at-rest encryption. This IBM Redpaper™ publication explains the architecture and design of the XIV and IBM FlashSystem A9000 and A9000R encryption solutions. Details are provided for configuring and implementing both solutions.